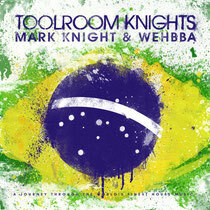 Toolroom Knights crash lands in Brasil, with head honcho Mark Knight leading the way alongside São Paulo’s Wehbba to provide a double mix compilation of some of the finest tunes set to rock South America’s dancefloors. Showcasing his musical expertise, Mark gets deep in the mix, blending 16 house workouts: from the underground rhythms of Lovebirds’ ‘This Time’, through to the driving vibes of Gary Beck’s remix of ‘Bounce To The Beat’, Nicole Moudaber’s remix of ‘Shake Your’ and Mark’s own seminal production, ‘Alright’. Wehbba steps up working in 16 tracks for his home crowd; the exclusive sounds of Christian Smith’s ‘The Tip’ lead the way to tribal-like beats from Matthias Tanzmann’s remix of Pete Tong’s ‘Wardance’, Riva Starr’s party rework of Funagenda’s ‘Afterclub’, through to Webbha’s own flavours with ‘Raw Vision’ and another exclusive cut, ‘Deliverance’. It’s out now.